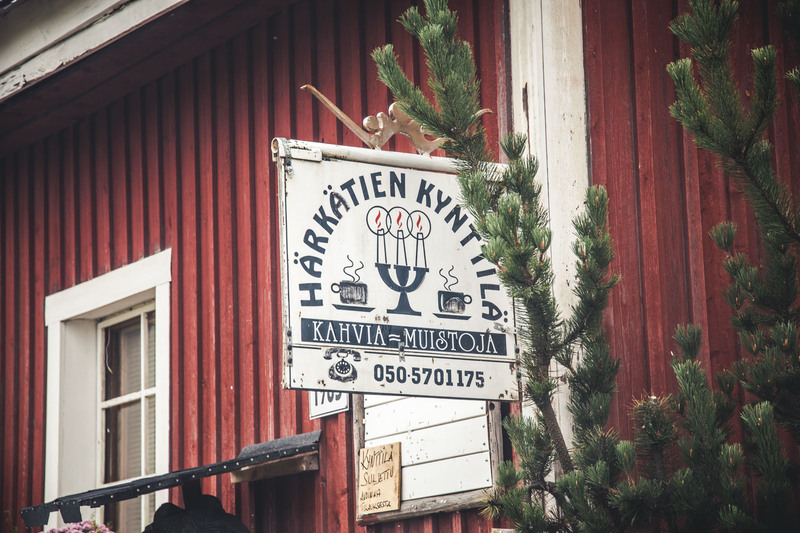 Porvoo is one of Finland’s best loved national landscapes, with its red wooden riverside storehouses and pastel-coloured buildings belonging to the old town, its river valley and its National Urban Park. National Urban Parks are an assembly of natural spaces, agricultural landscapes and built areas of cultural significance in and around the urban environment. 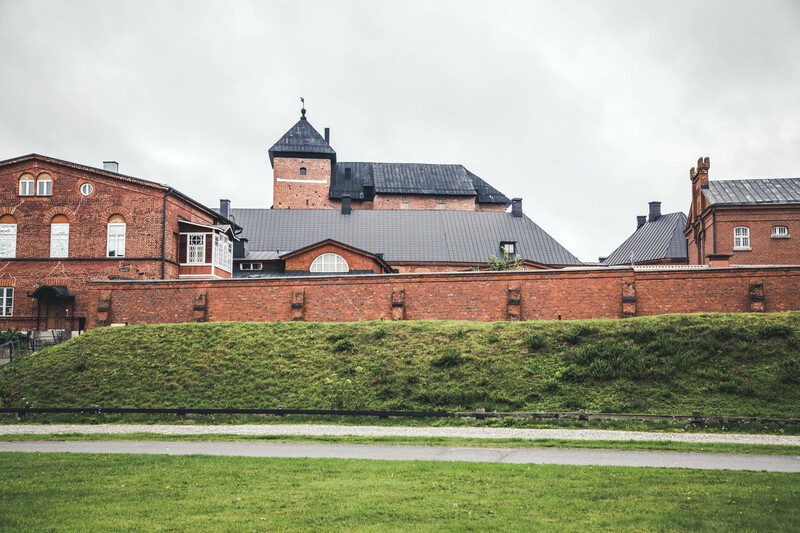 Porvoo’s Urban National Park is made up of the historical town itself, ancient relics, nature conservation areas as well as parks and recreational areas used by urban residents. Altogether this forms about 1,112 hectares. 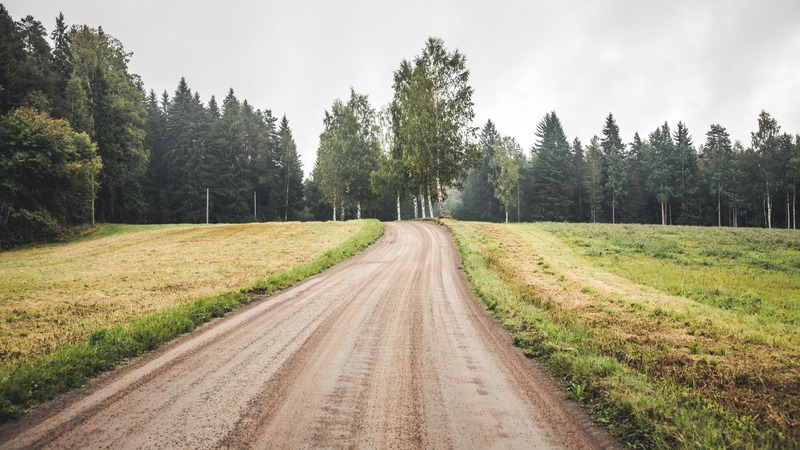 While writing this I discovered that Urban National Parks can also be found in seven other cities around Finland: Forssa, Hanko, Heinola, Hämeenlinna, Kotka, Pori and Turku. My own National Urban Park exploration began on board a Jopo bike courtesy of VisitPorvoo, which can be rented from under Mannerheiminkatu bridge. I set off just as the bells of Porvoo’s handsome cathedral struck ten o’clock, as if someone had fired a starting shot for a race. Weaving through tourists enthusiastically taking pictures with their smartphones, I peddled through the cobbled streets, over the bridge and then onto the bicycle lane alongside Porvoo river. I had boldly chosen a gearless bicycle, having concluded that I would be riding mainly on flat terrain. Riding on a Jopo also felt reassuringly nostalgic and like a laid back way to travel on a sunny day. Having decided on Haikkoo Manor as my destination and point for turning back, I peddled along Porvoo’s western bank. The city’s old and new centres were left behind on the opposite shore, as I continued my journey south alongside relatively new apartments. From my bike saddle, I observed boats laying idle in the harbour as well as gliding along the water. 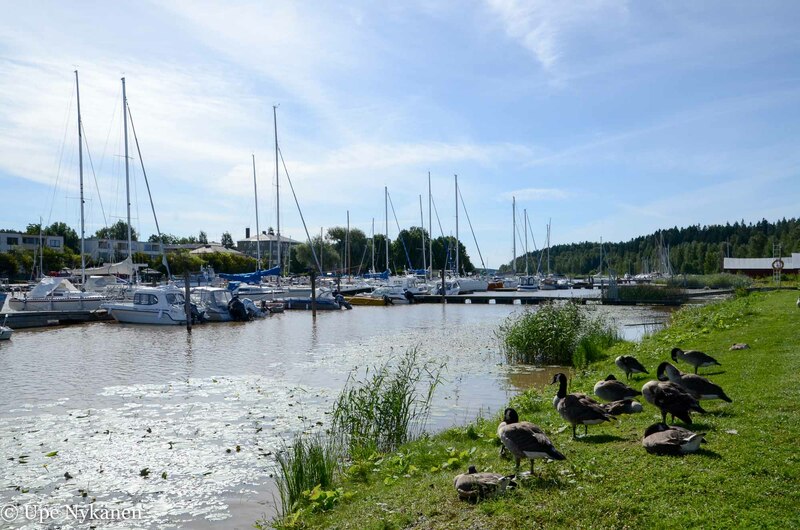 Canada geese were resting on the river bank as I passed The Art Factory, where Visit Porvoo’s travel info is based and from where you can pick up a cycling and outdoors map. I spotted its #URBCULT- area, in which school kids had been nurturing vegetables planted in containers made from old pallets. There was even sauna on offer there in celebration of summer! After the cycle path had curved round into Kokonniemi, I stopped for a moment to admire a some street art on the wall of the pumping station, inspired by the famous Japanese print The Great Wave of Kanagawa. On my right the coniferous hill of Kokonniemi rose up steeply. Soon I came across a maintained park area with a campfire pit – a great place for a picnic. One couple had set up their picnic chairs on the lawn of the river bank, but the two campfire sites made out of concrete well rings are a much better way to cook your sausages than using disposable barbecues. I do advise taking your own firewood though, as I didn’t notice any provided by the city. 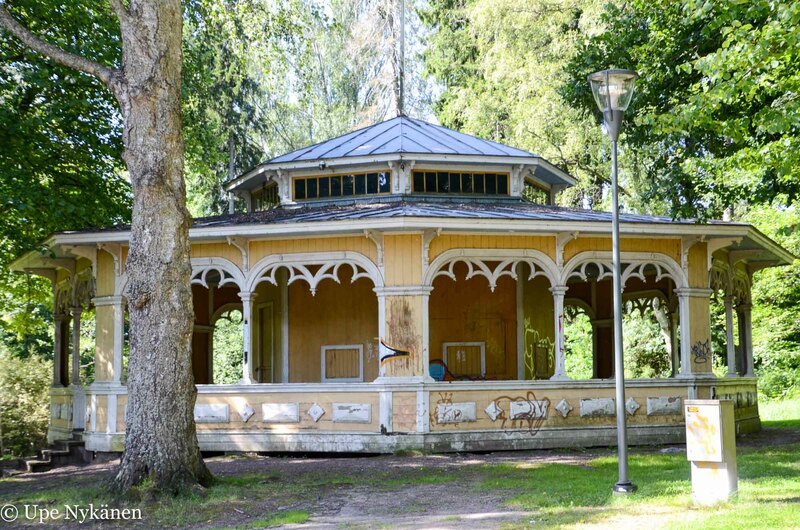 The features of this park at the tip of Kokonniemi are charming, with a delicately carved yellow pavilion (unfortunately somewhat vandalised), as well as a magnificent straight avenue of linden trees, which leads from it to the beach. This would be a lovely spot for a summer cafe. Looking at the pavilion and the view, images of old, black and white domestic movies started to play my mind: a manor house romance; a couple in love walking along the linden tree avenue in the summer dusk, a violin playing softly in the background… The park’s construction began in 1891, which was an acknowledgement of the location’s beauty and elegance. After admiring the park, I cycled ahead on a gravel cycle path and started to crave ice-cream. Looking at the map I noticed, with relief, that nearby was Kokonniemi’s campground, which would be sure to have some. I broke into a little sweat cycling up hill, but at least I had earned my ice-cream. I took this opportunity to inspect the map further. 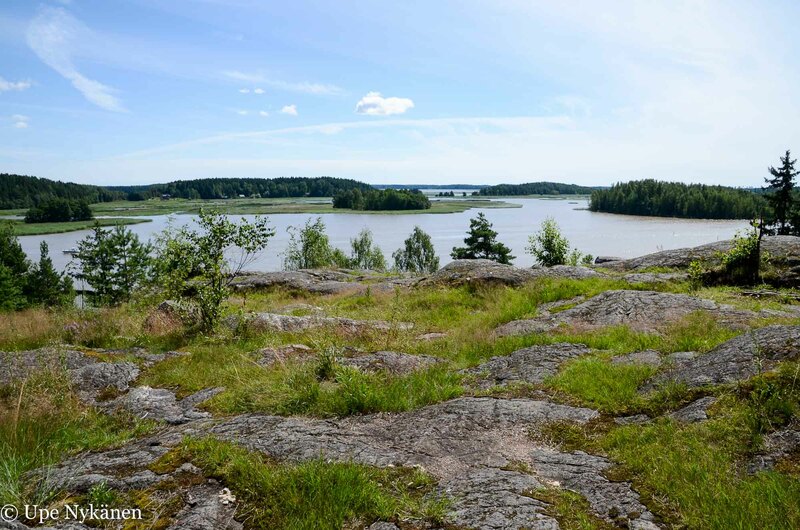 I noticed as I left the camping area, that the rocks of Kokonniemi were gleaming at me from the other side – another place to go and explore. Approaching Uddas, the view opened out along with river’s mouth, which stretched out on my left. The reedbed continued as far as the eye could see and the sea could barely be spotted behind all the greenery. 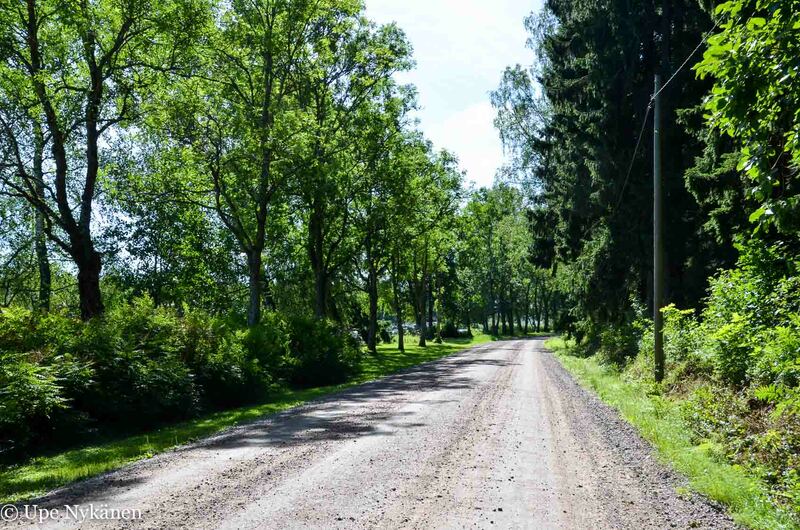 The cycle path continued to be even and easy until I reached Uddas, where there was a small uphill before rolling into the forest. I made a little stop again: the raspberries on the side of the cycle path looked too good to resist. Out and about were other cyclists, joggers and a few walkers. It was especially pleasing to see one particular couple: the lady was jogging while the gentleman accompanied her in an electric wheelchair. It was great to see that this route in the middle of nature was accessible, for all to enjoy. When I came to the field, I chose the path on the coast and and started to look out for a cycle path on the right. Somewhere the path had to rise up to a vantage point. Then I came to a small beach, where a couple of families where sunbathing, and noticed that a path branched out from the cycle path uphill to Tornberget, next to a granite column, with a mysterious engraving of the number 60 on it. I parked my bike on the side of the coastal path and clambered up the gently rising trail in hope of finding the vantage point. The forest path was a joy to walk, with the leaves shimmering in the sun. Without the drone of cars anywhere nearby, it was completely quiet except for a bird fluttering and chirping in a nearby tree. Further up, I came across a fitness route which had stretching apparatus on the side of it. I turned past it onto the path that led to the left. And then again to the left, on the coastal side. With my mouth blue from Tornberget’s juicy berries, I walked onto the almost bare rocks and was presented with a fantastic view towards Porvoo River. This was the moment to sit down and dig out my sandwich and water bottle. I did slightly regret not filling up my tea flask that morning, but that was quickly forgotten. It did me a world of good watching the shimmering water, boats occasionally floating by and a few fluffy clouds in the blue sky. Back on my bike, after peddling a few metres; I noticed another path leading upwards after the rock walls of Tornberget. The path seemed to promise another fine view, but I decided that my next scenic stop would be a vantage point further along. As I passed the shore of Hamari, I took a peek at cute, old houses which the local sawmill workers had built for themselves. At some point Hamari used to have its own harbour and docking station. If I hadn’t already had a snack break, I would have stopped at the beach cafe, but instead I looked for the route to the Lennätinkallio nature conservation area. 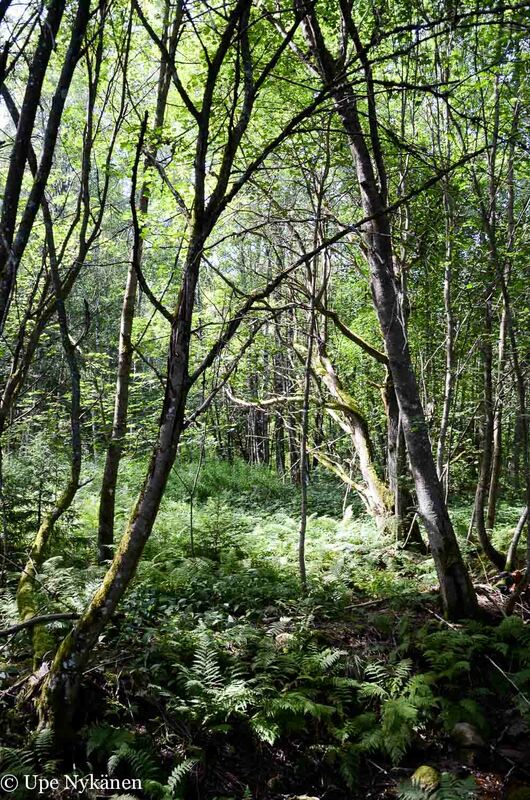 The area’s forests have been left alone to grow in peace since 1961, when the nature conservation area was established. I cycled along the park road and then to Haavikkotie road which shot me out onto the the fitness trail. I left my bicycle parked on the edge of the forest and picked up the first path going up on the left and decided to aim as high as possible, sure I would find the vantage point around there somewhere. I scrambled for a little while on the pine dominated rocky hill and wondered where to go, but then took the widest path into the spruce forest. From there I found the vantage point with it’s small lookout tower. At the lookout tower there’s a picnic table. You can compare the view with the image of it that hangs on the side of the tower, by the internationally known painter Albert Edelfelt. Some kids turned up from the straightest path from Lennätinvuori clutching their mobile phones. I suspect they were not there for the view, like I was. Probably on a Pokemon mission. Because the tower is low, you don’t see over the tops of the trees as far as Porvoo’s centre. 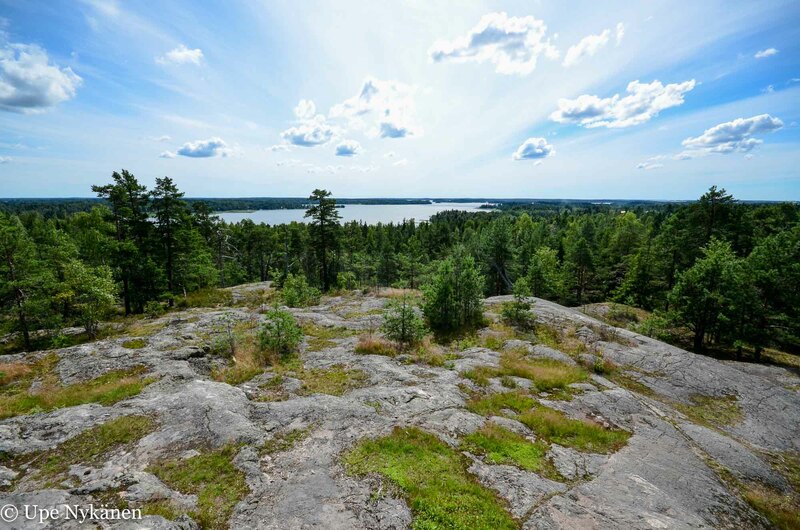 The view is mainly of forest and the open water of Haikkoo on the horizon. I descended on the occasionally very rocky path that led down from the observation tower and back onto the fitness trail, peering at the forest view. 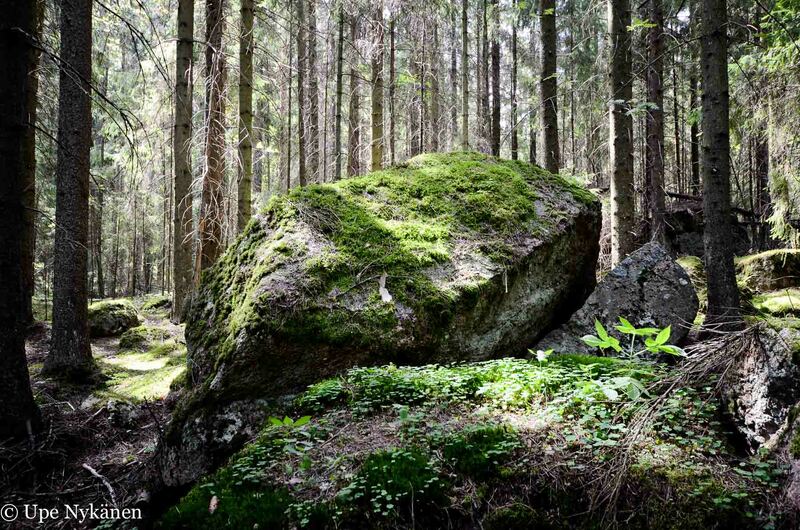 The light dappled onto the dazzling, beautiful moss, the trees and on the scattered boulders. I let out a sigh. After that I peddled towards Haikkoo on the nearest cycle path. However, I didn’t stop immediately at the Manor House and Spa, but continued by journey downhill, it was only 600 metres from the crossroads to Albert Edelfelt’s studio museum. Almost immediately I spotted a sign on the right hand side of the road. 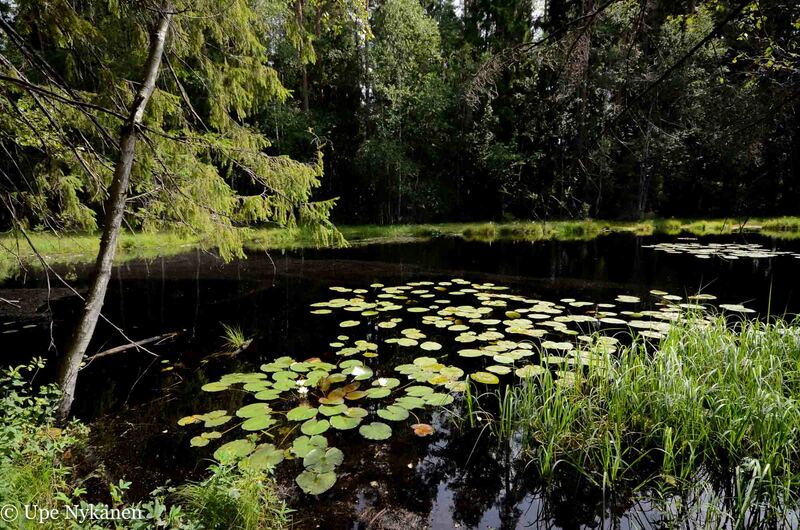 It indicated that a pond featured in Edelfelt’s painting was on the right hand side of the fitness trail. Naturally, I turned down it and continued cycling the forest route towards this other art subject. The marked fitness trail was primarily for skiers and walkers, but it was also easy to cycle. 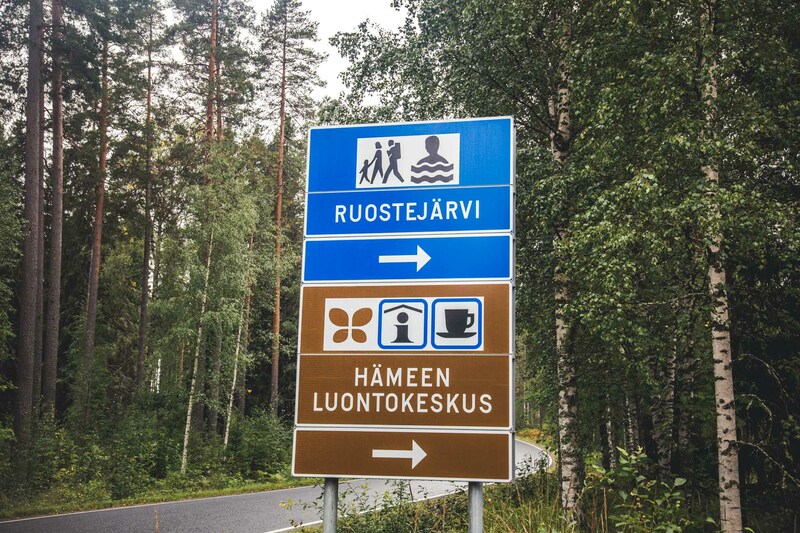 The good signage to Haikkoo’s pond was a bonus. I parked my bicycle on the side of the fitness trail and walked on the bumpy and partially damp path towards the edge of the forest pond. 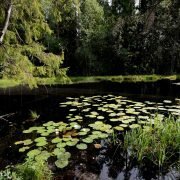 Haikkoo’s forest pond was charming with its waterlilies, which blossomed joyfully as they did in the painting itself. A large print of the painting was also on display in situ, which enabled comparison of Edelfelt’s version with the live view. I wondered if he carried his drawing and painting materials to the place himself or if he had an assistant. Did the models have to shiver in the pond for long? 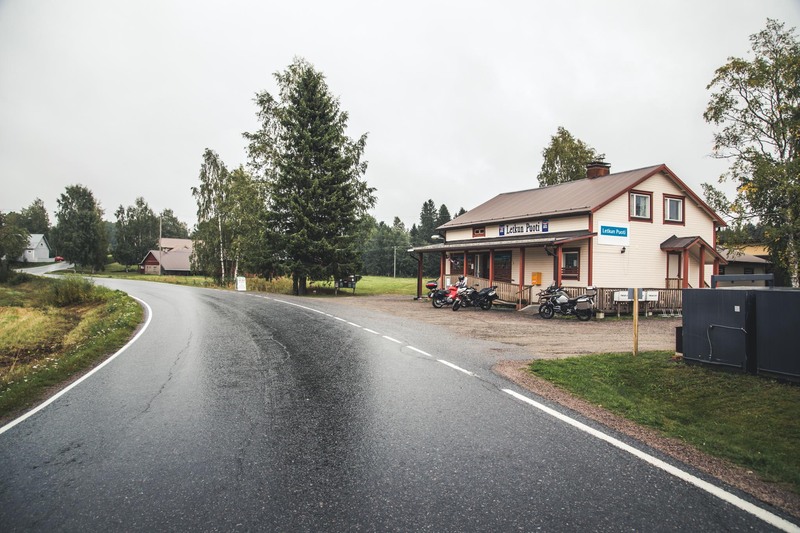 I returned to my bicycle and rode along the fitness route back to the nearest residential area and from there to the crossroads, where I reached Edelfelt’s path which led to Albert Edelfelt’s studio, which now serves as a museum. An engraving on a rock in the garden confirms that Edelfelt (1854-1905) worked here for 24 summers. 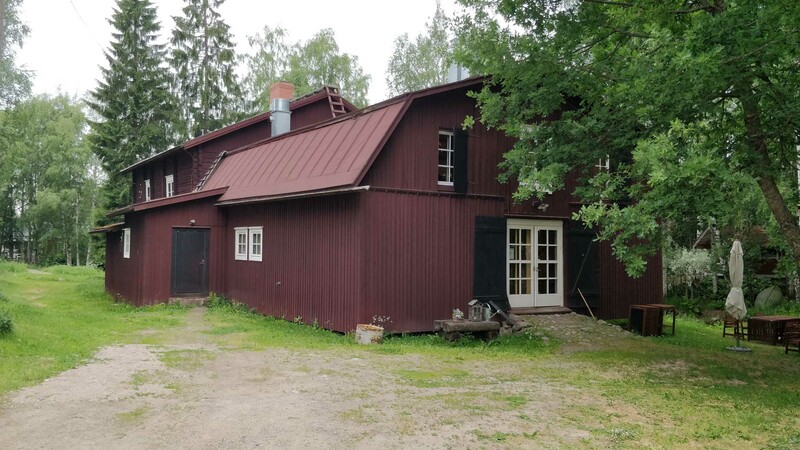 Albert Edelfelt had been so fond of Haikkoo’s nature and landscape that in 1880 he bought himself an old estate manager’s house, and in a few years had a studio built for himself with windows in the roof. There were excellent views of Haikkoo’s open water from the house. The trees on the plot have obviously kept growing since then, but right on the shore you can still see the landscape. 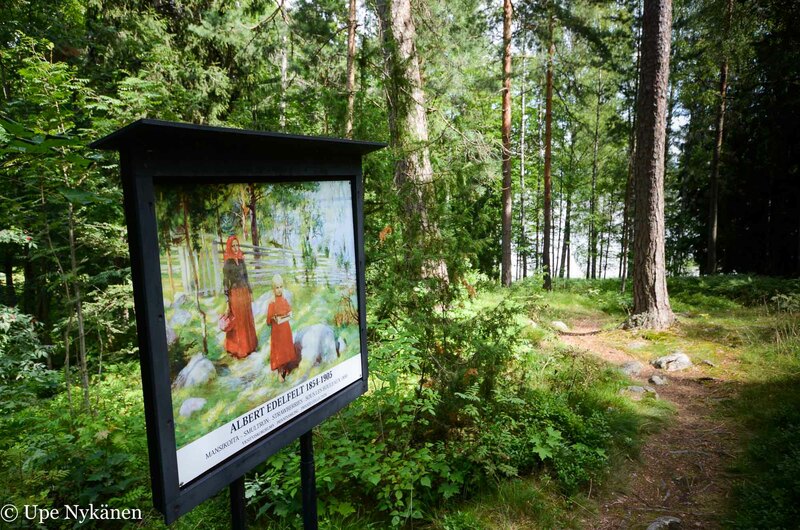 In the garden of the studio, I noticed a few pictures of Edelfelt’s works and before going into the museum, I walked down the path towards the shore. More photos of paintings! This was a really nice outdoor exhibition and it was interesting being in the exact locations where the paintings were painted. Down by the water, there was a table on a wooden bench. If you happened to have a print of Edelfelt’s Haikkoo painting with you, you could sit and observe what had changed in the landscape. I popped a few wild blueberries into my mouth and stopped at the museum, where a guide was talking about Edelfelt’s life, the paintings on display (which were duplicates) and the artefacts, fluently in different languages. Then it was time to head back. I peddled and at times had to push the Jopo bike up hill. Then, sweating, I turned right into the courtyard of Hotel Haikko Manor and Spa. It was very grand. 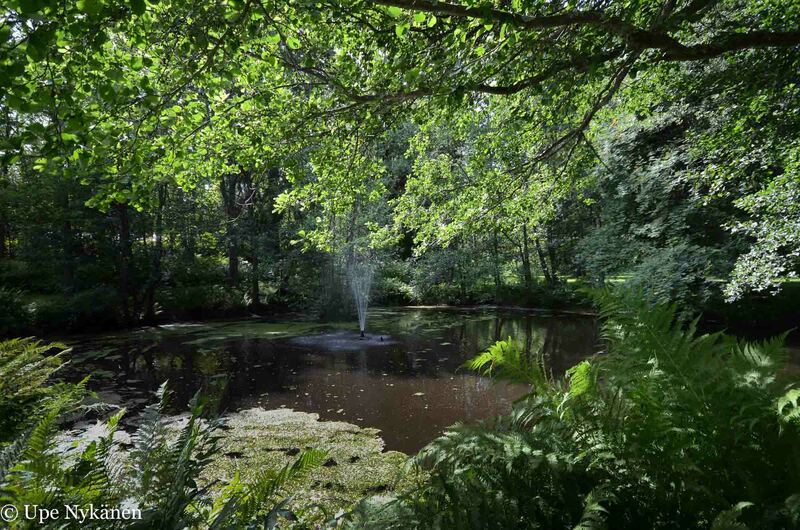 However, the pond with a fountain near the parking area softened my heart – it looked somewhat unruly in the middle of this manicured milieu. My bike waited in the parking area, as I took a short stroll in the gorgeous grounds of Haikko Manor, where lawns and flowerbeds lived in harmony with frisbee-golf baskets. InHotel Haikko Manor and Spa there’s a cafe where daytrippers can go and have a sweet or salty snack, you don’t have to be an overnight guest. 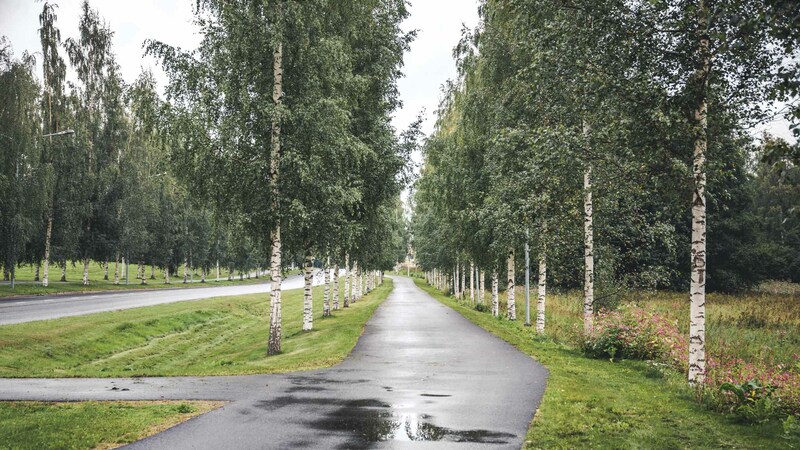 I returned to my bike, passing a white Rolls Royce, and then cycled back along the same way that I came, following the wonderful waterside route back to Porvoo, where I returned my rented vehicle to Mannerheim street under the bridge. 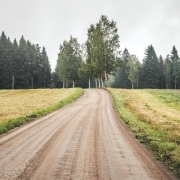 A shorter route would also have been possible, but why take a short cut if you don’t need to? 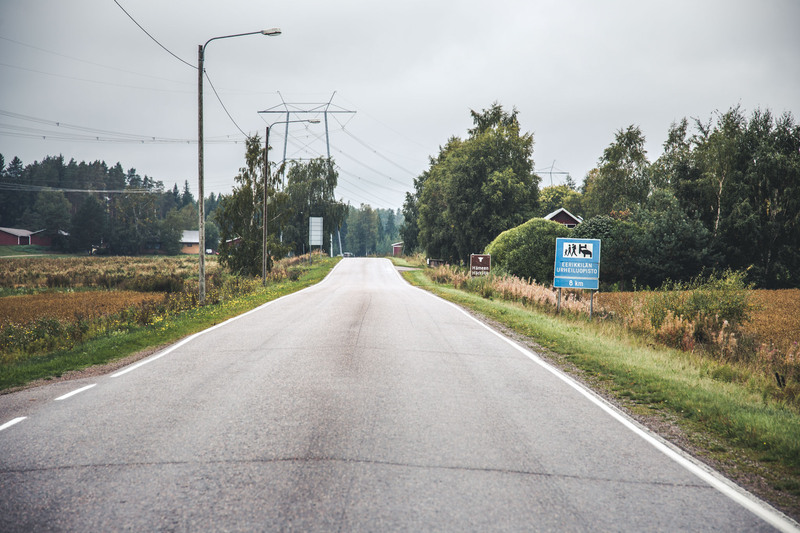 As I cycled I thought that you could quite easily do this day trip from the centre of Porvoo to Haikko just by walking. 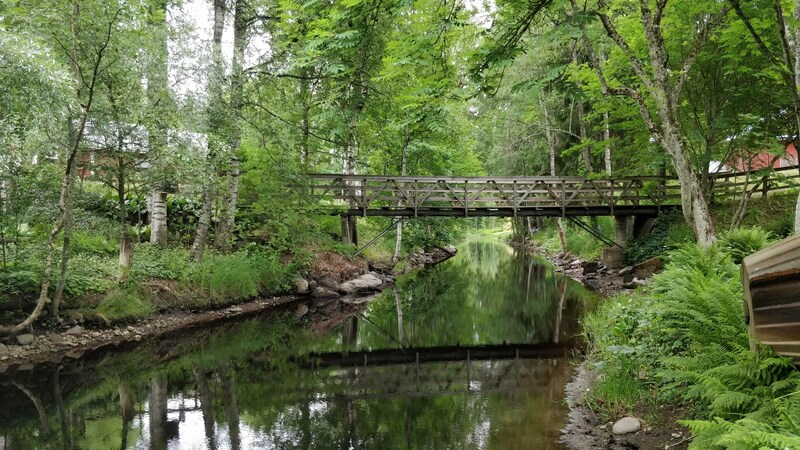 Porvoo’s National City park is a great outdoor destination because it’s easy to hike there on your own, on short or longer routes, and keep within a stone’s throw from cafes if you wish. 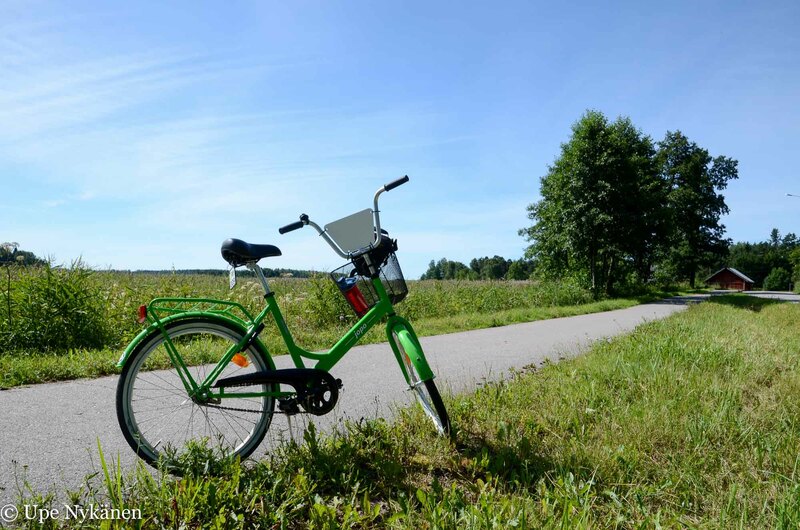 Or you can rent a bicycle and explore a wider area. 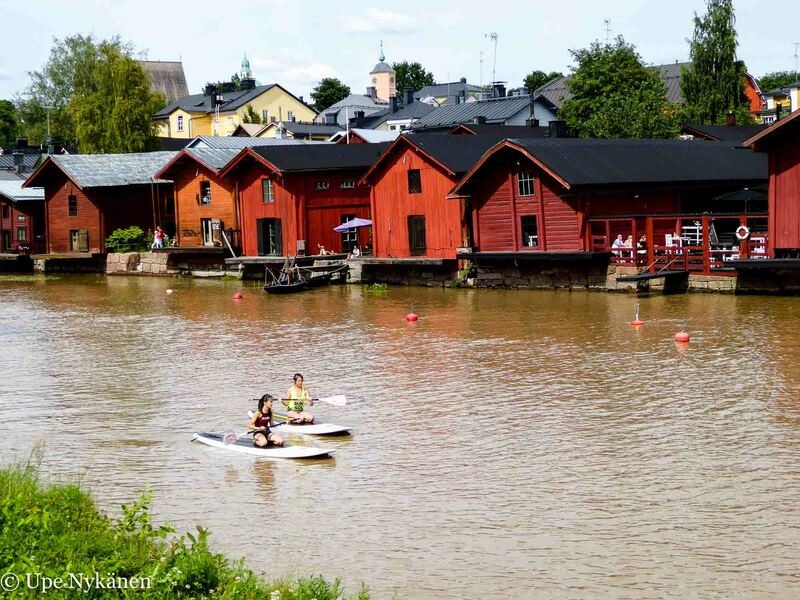 When I saw the stand-up paddlers I immediately felt like paddling along Porvoo river. 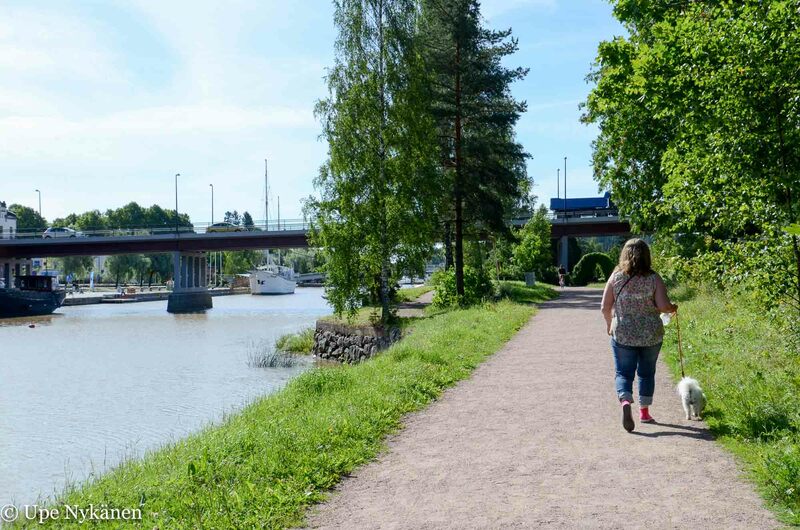 I can honestly say, that one day is nowhere near enough to explore the National Urban Park that spreads out across both sides of Porvoo’s river. To help you plan your trip, there is some excellent material available. 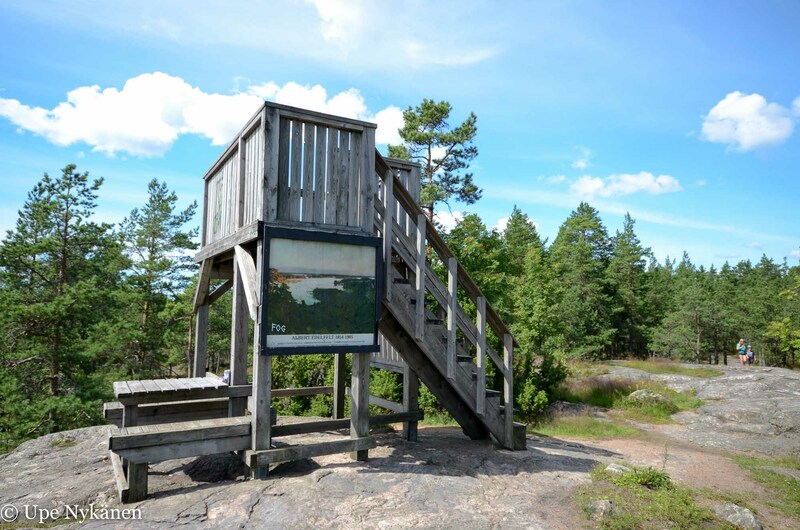 You could start with the ready thought-out themed routes (find the downloadable PDF maps here) and pick up a pocket-sized leaflet with you about the park or a free cycling and outdoor map from the Visit Porvoo visitor office which is in the Art Factory on the river’s western bank. For those interested in art, there’s a leaflet available that tells you about areas connected to Albert Edelfelt. You can depart from wherever you like, follow the suggested routes or go off and create your own mini adventure! Edelfelt’s studio and museum on the map. 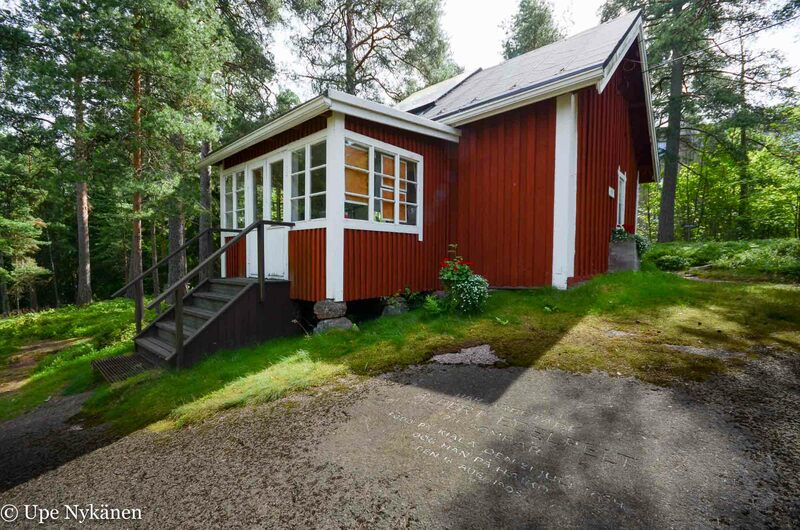 Address: Edelfeltinpolku 3, 06400 Porvoo.